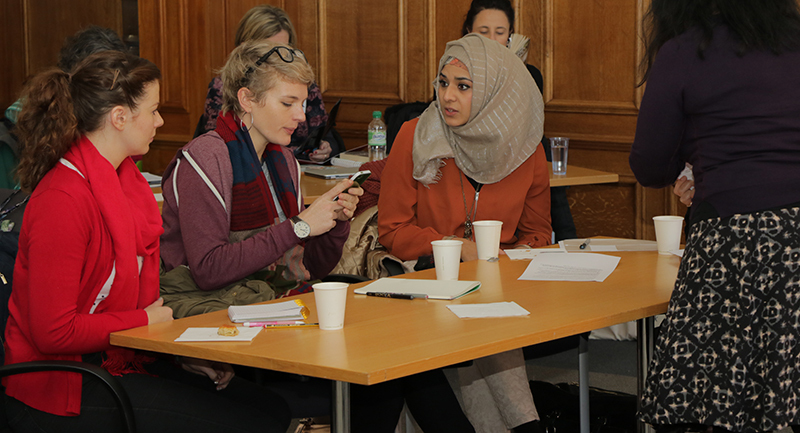 English teachers gathered for a conference at Middlesex on Friday 11 November to discuss how work on language, literature and writing can be integrated in English classrooms. This was immediately followed by the National Association for the Teaching of English (NATE) Post-16 conference, also hosted at Middlesex, and featuring Middlesex’s Dr Billy Clark as a keynote speaker. The conference on the 11th was the fourth organised by the Integrating English project, an initiative developed and led by English experts Dr Billy Clark, Associate Professor in English Language and Linguistics at Middlesex, Dr Andrea Macrae from Oxford Brookes University, and Dr Marcello Giovanelli from the University of Nottingham. “The Integrating English project promotes a view of English as an inclusive and broad discipline that includes many different approaches and ideas,” says Dr Clark. “English is a diverse subject, covering work on language, literature, writing and other areas. Our project promotes a view of English which sees this diversity as a strength, encouraging connections among different areas as well as more specialised approaches. Teachers and academics spent the day sharing best practice, developing resources, generating classroom materials, and finding out about other support and resources. Teachers led some of the sessions and discussed their own classroom experience. One teacher in attendance was Grant Bonthron, a recent Middlesex English graduate who is now subject leader for English at Cleeve Park School in London. “This project is very current and it’s great to have it hosted at Middlesex, where the English professors have a wealth of experience and knowledge,” said Grant. The Integrating English project is resonating with teachers and academics across the country. Members of the team have been invited to give several presentations on the project, including at the University English Annual General Meeting at Oxford earlier this year. Next year, the team will contribute to ‘Shared Futures for English’, a major international conference exploring new directions across the discipline. On Saturday 12 November, Dr. Clark and Dr. Giovanelli contributed to the NATE Post-16 conference at Middlesex. Dr. Clark and Professor Robert Eaglestone, from Royal Holloway University of London, were invited keynote speakers providing Higher Education perspectives on the transition from school to university. ‘These are exciting times for English,’ said Dr. Clark. ‘And it’s a great time to be at Middlesex, which is playing a key role in shaping these ideas’. Learn more about our new BA English course, which reflects the thinking of the Integrating English project.